A great limestone pinnacle rises from the ground; the river Qemasen Stahlew ("Ravine River") carves a path along its eastern side. Comprised of three parts, the oldest portion known as the Lower City nestles in a huge opening in the stone along the river bank. Above, in the air, the slightly younger Upper City is perched in the top of the limestone. The newest ward of Tawen, the large and varied Outer City, sprawls around two great bridges crossing the canyon from the pinnacle to the eastern bank. The warrens of the bottom of the pinnacle are the home to the People of the Fields: Mouse – "Ketan"; Squirrel – "Toepsipaen"; Rabbit – "Sqeweo" and Rat – "Hewt." Many craftspeople make their homes here. Docks stretch out onto the river, launching boats that make their way north to the inland lake. In darker corners, Rats run the local Thieves Guild and other unsavory businesses. "This time, this First Age, was a dangerous time upon the world. For not all those who learned magick were of a good spirit. Magick was power and evil sought this power to wield against the good as well. The people were in danger and sought defense against the rising Darkness. We sought the knowledge of the Ancestors and learned that we might transform ourselves, become our spirit within and become people of two forms. Not just the temporary change of a magician or the flowing form of shape shifters, but people who were both Human and of the People." The People are similar to but different from traditional shape shifters or were-creatures. Shape shifters or Werewolves have but one body that can assume different shapes. Bodies grow or lose fur, change size and shape. Claws appear and disappear. The People have two forms, one human and one animal, that share a single soul/spirit/sentience. The People have inherited an ability (or skill) to change between his or her human form and their animal form. However, the change may also occur during times of stress or when one form has been hidden or inactive for too long (for both forms must eat, breathe and exercise to remain fit and functional). As well as this exceptional ability, both forms may be above average for their kind. The human form may be of any class or profession. "The first of the People studied, quested, and traveled the lands. After many trials and tribulations our new forms were gained. Upon the highest mountains arose the Eagle, across the wide plains ran the Lion, in the deepest woods roared the Wolf and Bear and in the corners of houses and barns, snuck the Mouse." In the past, spellcasters, like those of shamanic or druidical studies, found that they could bind their spirit to two forms, one human and one animal. The shape-sharer could move their point-of-consciousness (sort of a point of view) from one form to the other. The Eagle could fly. The Lion was a fey warrior. The Mouse could hide and sneak about. This gave certain freedoms and abilities but it also left the other form inactive and vulnerable. The early Peoples worked with other spellcasters, notably magicians with experiences upon other worlds and planes, to create "hearths" for the People. The Hearth was a magical place where the inactive form would be hidden from the real world in a form of stasis. Those of the People would concentrate on their link between their forms to cause their forms to swap places. To all intents they appear to "change" from human to animal and back again. As the Peoples grew and gathered, there was a need to keep track of the Hearths of associated tribes. Shamans reached out to alchemists and witches, who help create the Hearthstones. A Hearthstone is a mystical object that is a doorway between the world and the Hearths of a People. Each People have a Hearthkeeper, a spellcaster who cares for the Hearthstone. The Hearthkeeper can feel the links between forms for all of his or her People, and can determine the health and well-being of both forms. In times of need, he or she can heal either form or force the Change as needed. Tribes would defend both Keeper and Stone at all costs, for over the years the Hearthstones have become the key and identity of a People. "The Third of the Ages was a rebirth of the magicks. The realms of Spirit gave access to our Ancestors and we found some of the new Gods of Light were the same as those of old. The People grew and expanded. Others joined our numbers, both those who sought a second shape and others who found a way to change their shapes. Falcon, Hawk and Gull joined the Eagle in the skies. Squirrel, Rabbit and Rat joined the Mouse in fields and towns. Tiger, Panther and Cat joined the Lion upon the plains and in the hills. Boar and Badger joined the Wolf and Bear in the woods and forests. We spread across Arda, forming Hearths in many places. Not as many as other races but enough. For we survived the Fourth Age and grew again in today's Age." Over the years the People changed as their numbers grew. New Peoples arose to join the few from the earliest times. There also appeared differences in the People of the same Hearth. Eagles might be Gold, Brown or the majestic White-capped Eagles. Tigers might be striped or white. Wolves might be Wargs or they might be Foxes. Today there are sixteen tribes or Hearths of the People. 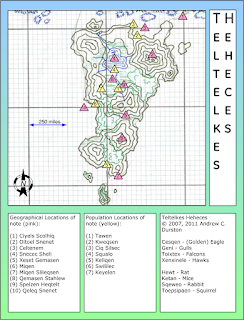 The introduction to the land of Teltelkes Heheces included a map of the island nation. Below the map was a short list of geographical points of interest and a 2nd list of population centers of interest. Those two lists are further detailed in this entry. 1. Cixels Scolhiq – the "frozen channel" is an ice-choked strait along the north coast of the island, between it and the arctic ice packs. It is only completely clear of ice during the warmest summers. 2. Oitoel Snenet – the "highest peak" is a beautiful sight, rising to the skies, north face painted with snow and glistening ice. The tallest mountain anchors the north-east corner of the island and rises to an elevation of over 12000 feet. Probably an extinct or long dormant volcano, Oitoel Snenet is an impressive sight. Its flanks are covered with swaths of forest giving way to fields of snow and ice. Rumor places a notable site or tomb called Rocaim's Watch on its eastern flanks. 3. Celtenem - Around an outcropping of land at the north-east corner of Teltelkes Heheces is "Boundary Bay" and in the bay's southwest corner, against the slopes of Oitoel Snenet, the fishing town of Kweqsen (P.2). Celtenem is usually ice-free except during the harshest winters when it has been known to freeze solid. When it does, it is said the resulting silence is most impressive. 4. Snecec Sheli - the "Lake of Life" sits in the north center of Teltelkes Heheces. It is a large body, almost an inland sea, which covers much of the northern half of the island. that its waters are also dotted with vessels (the lake is almost 135 miles across at its widest) and small islands." 5. Xeset Gemasen – is a narrow valley between the mountains of the east coast of Teltelkes Heheces. It forms a passageway between the vast forest to the west and the coastal plains to the east. 6. Miqen – is the tallest mountain in the southern portion of the island with an elevation of over 8000 feet. From Miqen one can see hundreds of miles across the seas to the south. 7. Miqen Slileqsen – is the southernmost point of Teltelkes Heheces. South of the island is a long chain of numerous smaller islands and many many outcroppings and rocks, making for difficult sailing for all but experienced local sailors. 8. 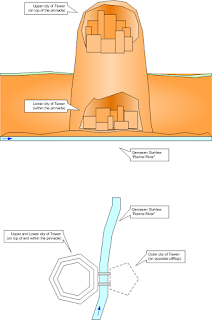 Qemasen Stahlew - the "Ravine River," runs north from the hills around the capital of Tawen (P.1) across the plains and empties into Snecec Sheli. 9. 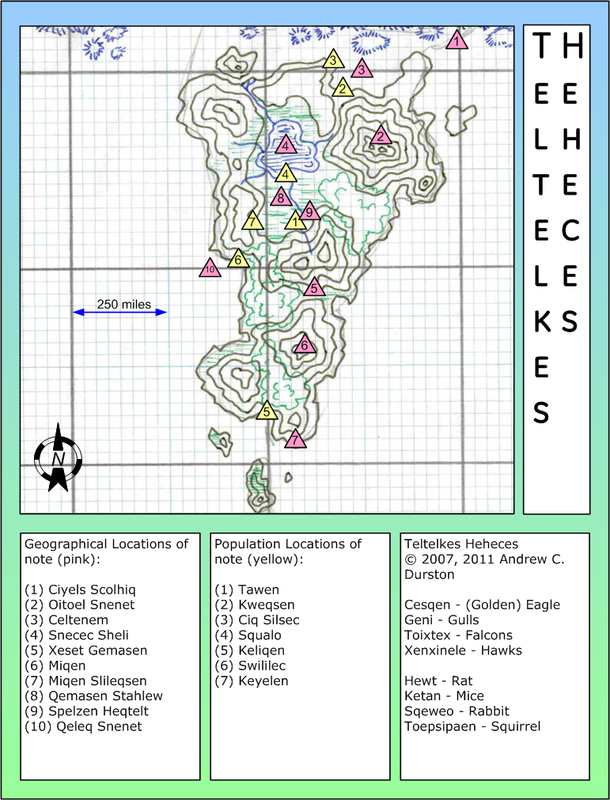 Spelzen Heqtelt - "Field of Tall or Giants" is the region of limestone outcroppings just north of Tawen along the Qemasen Stahlew. · "The weather of the world has gnawed away at the rock and left a field of pinnacles, like pieces upon a chessboard, arrayed along the north slopes." 10. Qeleq Snenet - "tangled rock" is a seaweed covered outcrop in the sea west of Swililec (P.6). It is considered a sailing hazard. 1. Tawen – capital of Teltelkes Heheces. A great pinnacle rises from the ground, the river carves a path along its eastern side. Comprised of three parts, the Lower City nestles in a huge opening in the stone along the river bank. The Outer City sprawls around two bridges crossing the canyon from the pinnacle to the eastern bank. And above, in the air, the Upper City is perched in the top of the limestone. slopes and winds about the vast rocks." revealed and ages ago a collapse created a hollow in the stone. There the first of my Peoples built the Lower City of Tawen. Up in the air, atop the pinnacle, there is a hollow. In that opening, Phoenat's People built the Upper City. Tunnels have been carved through the stone, shored by magic and man, to connect the two." · "As Tawen grew, other Peoples and visitors settled in the area. Soon the pinnacle began to become crowded. And so the Outer City was begun across the Qemasen and two great bridges built to connect it to the spire. Tawen thus continues to grow up, down and outward as you will soon see." 2. Kweqsen - "Boat Nook" appears much like any fishing village of other nations. · "Fishing boats drift in and out of the harbor, most, at end of day, lined up against docks or shore. But as you near, the differences in the people become more apparent. A cluster of seagulls circles about a couple on the beach. Several drop from the sky and with a flash become people joining their fellows on the sands. Further away a bear hauls itself out of the surf, a fish in its mouth, drops the catch, swirls into a man who grabs the fish and a nearby cloak hung on a staff. Swirling the cloak about his hirsute form, he heads towards a house fish and staff in hand." · "After about two hours of scenic but uneventful travel an area of forest comes into view covering the land from cliff-side to several miles inland. Heqtelt turns slightly inland and leads the group to an opening in the canopy only noticeable to Phoenat and the Falcon at this distance. Dropping through the trees, you land on the verdant forest floor. A short distance away you can see another clearing featuring a bowl-shaped depression with a fire-pit in the center. About the outer edges, between the trees, you see one or two doorways leading into dens carved into the earth." 4. Squalo - A town, Squalo, is nestled against the main bank of the Qemasen where it empties into the Snecec Sheli (L.4). Squalo is a popular stopping point for those making the journey from Tawen to points in the northern half of the island. 5. Keliqen – A large port, Keliqen is the southernmost population center of Teltelkes Hehecs. It is the gateway to the rest of the world, hosting traders and sailors from nations to the west, south and east. Distant from Tawen, Keliqen's ruling elders have sometimes strayed from following the Council of Eight in Tawen. 6. Swililec - a couple hundred miles south-west of Tawen, is a fishing port. Growing about a small cove featuring a natural breakwater of fallen cliffside, is the largest of Teltelkes Heheces' western ports. Ships may launch from there for the crossing to the many nations of western continents. The middle of fall signals a gradual decline in such shipping as the storms of winter spawn from the icepacks of the arctic. 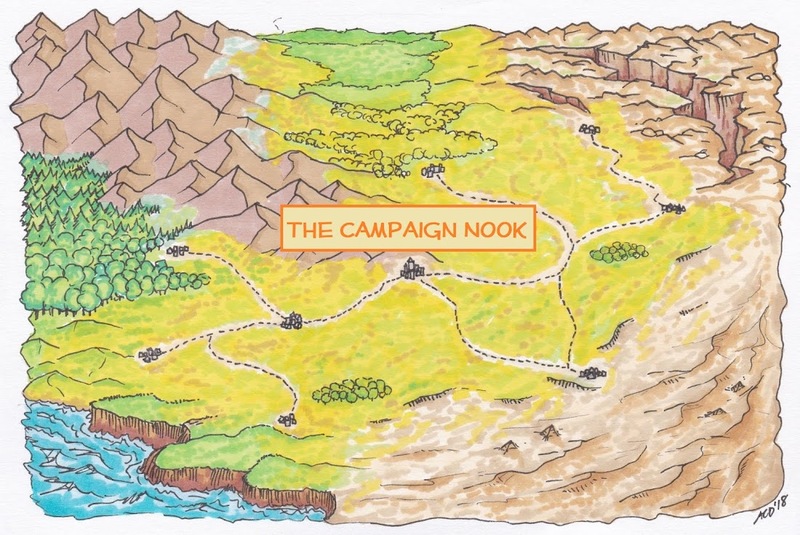 As a gamemaster, there may be many origins and accompanying origin myths for your world and the peoples upon it. If you choose to use Teltelkes Heheces and the People, I offer the following as the "creation myth" of the People. Here in their land, as the People's nature revolves about their Hearthstone, their daily lives revolve about the hearths of their homes. Those willing to house and care for others are well-respected and the 'giving of hearth rights,' that is providing room and rest space, a time-honored tradition. Most of the trade revolves about barter but the Innkeeper, a shortish burly fellow who smells like a bear, will accept the coin of all nations. Long tables with benches, encircling half of the central fire pit, serve as the dining room. A rather large Wolf, whose dark fur is streaked with silver and grey, snoozes alongside the fire. He appears to be well known to the Keeper and all present. Dinner is abundant and hearty; mostly fish and local vegetables, breads and cheeses but deer, pig and fowl are available as well. Locals who dine at the Ley Slamet vary between their human and shared forms, some even switching during the meal. The place is noisy, smoky and feels like a home. Once dinner is cleared away several of the tables are moved to the walls, the benches placed in a rough circle near the fire and the wolf, still snoring. Drinks are brought out, pipes are lit and someone strums a guitar in the background. "A tale for the evening!" someone calls out. "But which?" asks another. Heqtelt answers, "We have strangers from afar, let Slelex Toitoetoem 'Old Man Bird' tell of the beginning!" The crowd agrees and cheers. Slelex, a proud and old Hawk makes his way to the center and sits upon a rug placed on the floor. As the crowd quiets, the bard begins, "There was time before the Ages of this world began. A time when the sky was full of stars and the Young People leap from star to star as a pup chases a butterfly. The world was revealed to those People and for the first time they met the Dwarves, enamored of dirt and rock, and the Elves, of land and life. There were those of Terrans who learned of our world and the Ancestors told them that it was special. The magicks, so rare across the stars, were here as well." "And so they came, our Forefathers, and landed upon our world. They found kin among the Elves, for they too knew of the magicks, but the Dwarves were ignorant. For years they studied together, Shaman and Druid and Animist, for magick was but a trickle and elusive. Then came the Cataclysm and the world was swallowed by the Maelstrom but remained whole and viable. To their surprise the wise men and Elves discovered that trickle was now a torrent. The world was flooded with magicks and the gizmos and widgets of the Dwarves and others were overwhelmed and began to fail." "The first of the People studied, quested, and traveled the lands. After many trials and tribulations our new forms were gained. Upon the highest mountains arose the Eagle, across the wide plains ran the Lion, in the deepest woods roared the Wolf and Bear and," winking at Tosca, "in the corners of houses and barns, snuck the Mouse. As the First Age ended there were few of the People and they were scattered. When the wars of Light and Dark ended, and new Gods rose into the Heavens, a Second Age began. But magick was diminished and our people suffered. But they survived and once again time turned." "The Third of the Ages was a rebirth of the magicks. The realms of Spirit gave access to our Ancestors and we found some of the new Gods of Light were the same as those of old. The People grew and expanded. Others joined our numbers, both those who sought a second shape and others who found a way to change their shapes. Falcon, Hawk and Gull joined the Eagle in the skies. Squirrel, Rabbit and Rat joined the Mouse in fields and towns. Tiger, Panther and Cat joined the Lion upon the plains and in the hills. Boar and Badger joined the Wolf and Bear in the woods and forests. We spread across Arda, forming Hearths in many places. Not as many as the Young Races but enough. For we survived the Fourth Age and grew again in today's Age." Slelex puffs upon his pipe and concludes. There is applause, roars and slapping of hands or paws upon tables. The Wolf yawns and rolls over.